The process of manufacturing pasta has come along way since the days when strings of spaghetti were hung out on long lines on the streets of cities to dry in the sunshine. An eye catching and evocative image it may well be, not least reflecting the romantic ideal attached to the product that marketing departments continue to exploit. But it is certainly not a process in terms of size and scale that would satisfy the demands of either the global market or the big companies feeding the consumers' insatiable demand for such products. As a result, industrial machinery has replaced human hands and pasteurizing plant has eliminated potential hygiene issues in order to ensure consumer confidence remains high. Dried pasta is manufactured in many of the large industrialised nations but the big supermarkets and the growing sector of delicatessens and Italian specialist shops tend to stock pasta products originating in Italy. 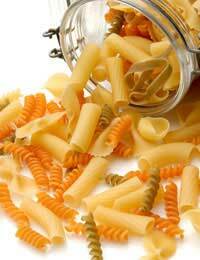 De Cecco and Barilla are just two of the names that have become familiar to consumers. Flat products such as tagliatelle, lasagne and linguine are laminated, the dough flattened out into large sheets from which the desired length and width is cut. In the case of a twisted shape such as fusilli, conveyor machinery replaces the laborious of method of twisting the pasta. The process then moves onto thermal dryers, sometimes at a temperature as high as 80 degrees centigrade, although some manufacturers believe a lower temperature achieves a better result, before automated packing where the finished pasta is sealed in either packets or boxes. Quality control is another important aspect of the industrial operation. What tasters will be looking for is colour, firmness, and in the case of long, thin shapes such as linguine, that the product retains a certain amount of elasticity after the cooking process rather than limply curling up in the bowl. Competition in the worldwide market is intense. Manufacturers are fully aware that they are catering for an increasingly sophisticated audience whose knowledge has been deepened both through tourism and the range of cooking programmes that form an important part of the schedules of many television stations as well as specialist channels.Dried pasta has come along way since the days when it basked in the glow of the Mediterranean sun. If it doesn't live up to expectations, it risks being left in the shade by superior brands, or rather at the back of the cupboard.